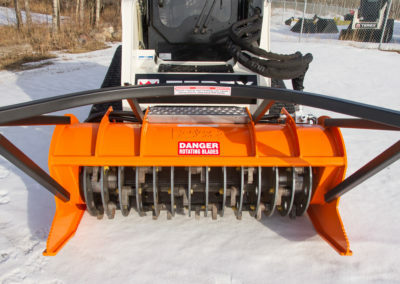 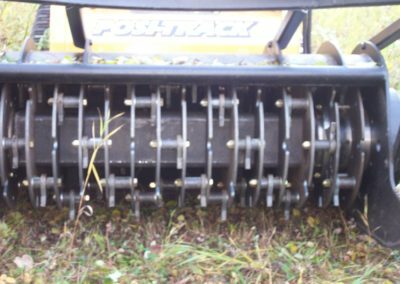 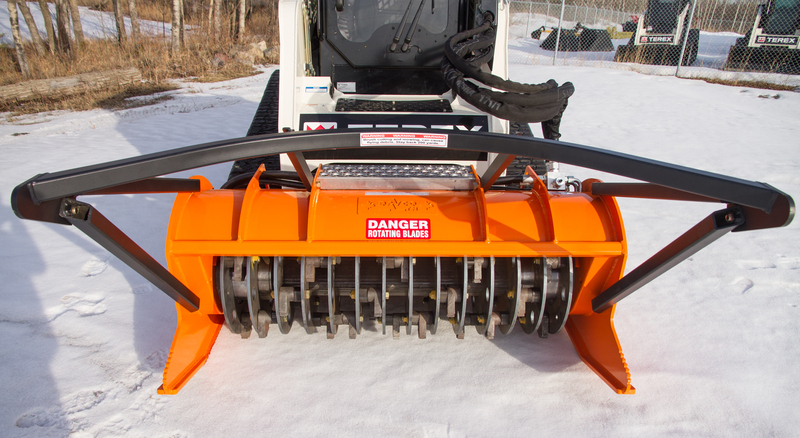 PACU 5 Mulcher - Davco Manufacturing Ltd.
Side Plate Horns for positioning deadfall, moving objects out of the way, as well as aiding in containing the mulch for a safer operation and a finer finish. 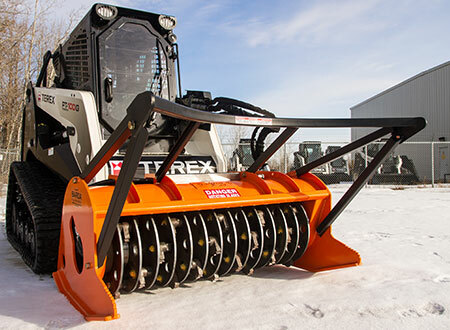 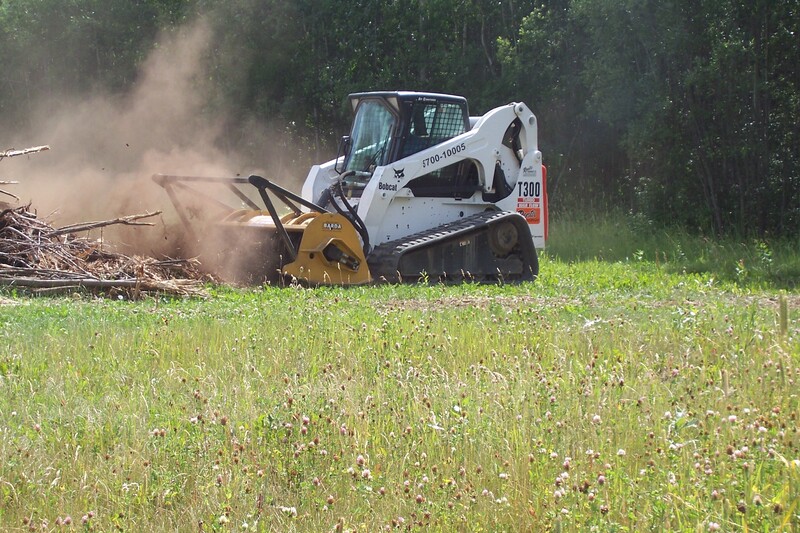 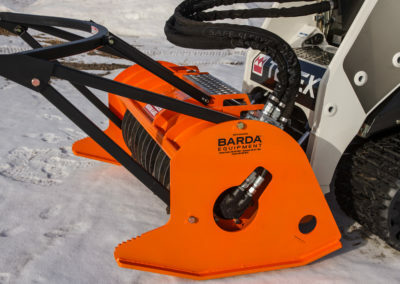 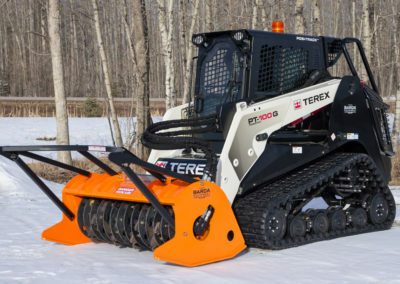 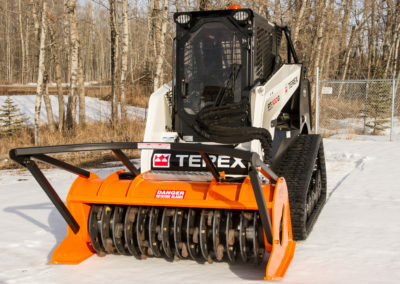 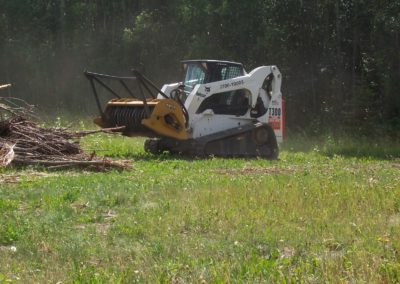 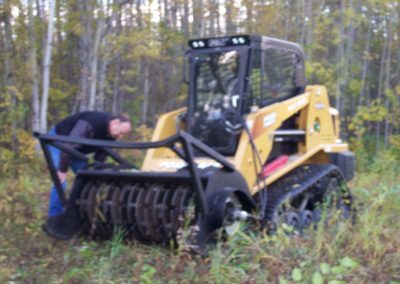 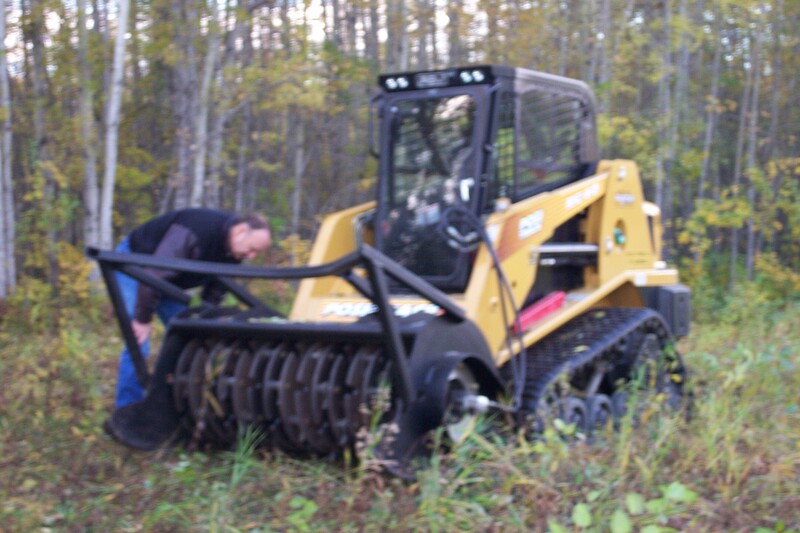 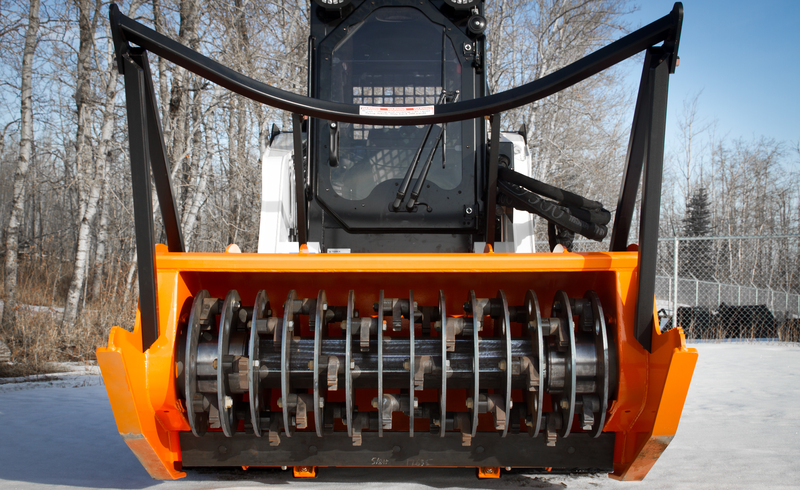 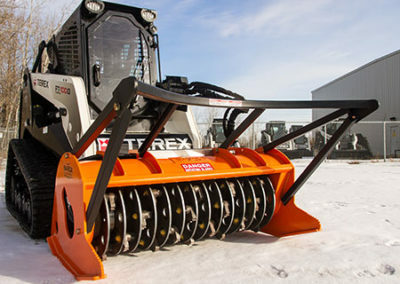 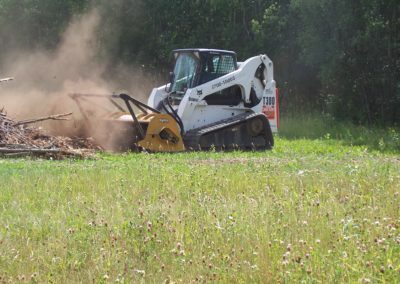 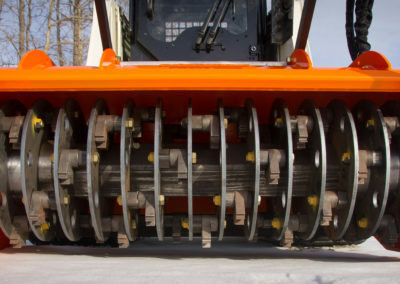 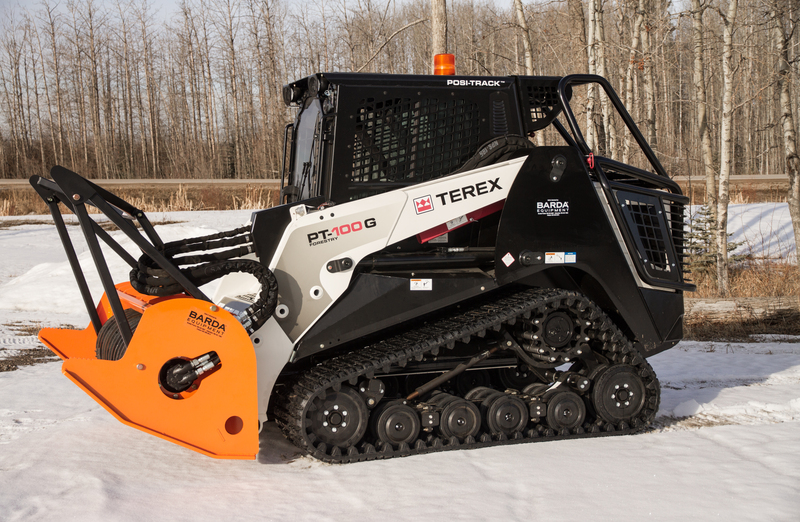 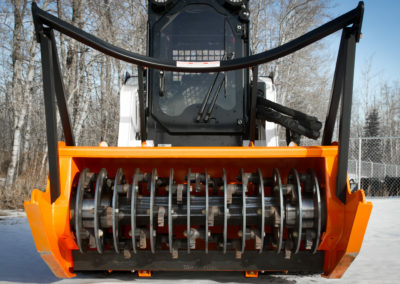 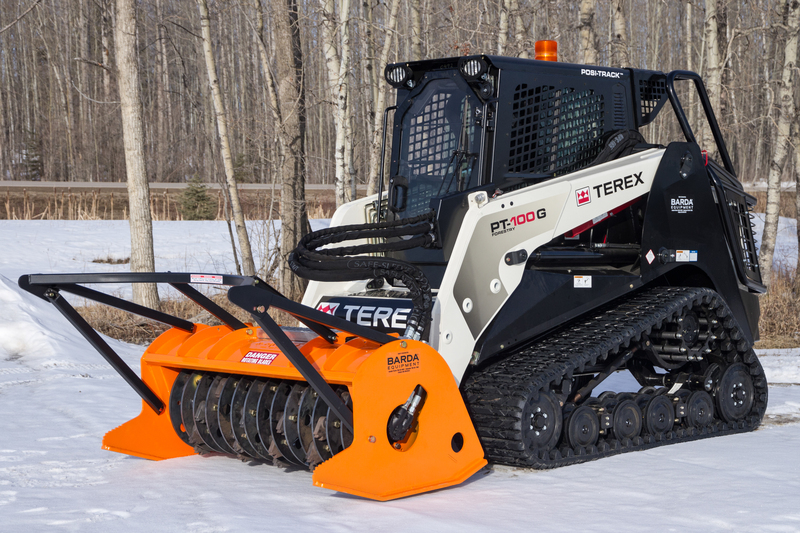 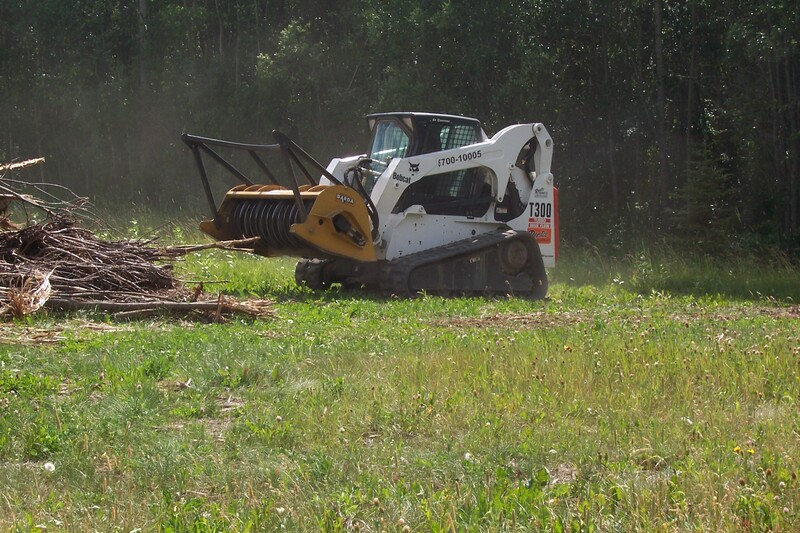 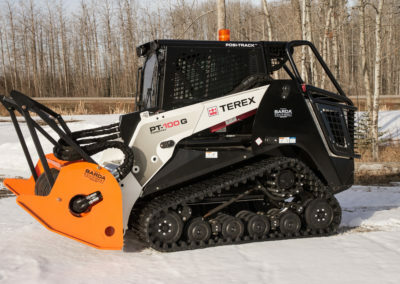 Side Plate Horn also reduces the possibility of the rotating drum throwing debris at the Machine & Operator when the Mulcher is tipped forward, lifting the rotating drum off the ground. 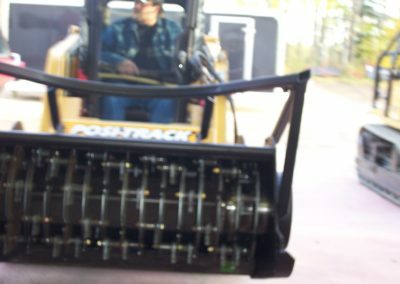 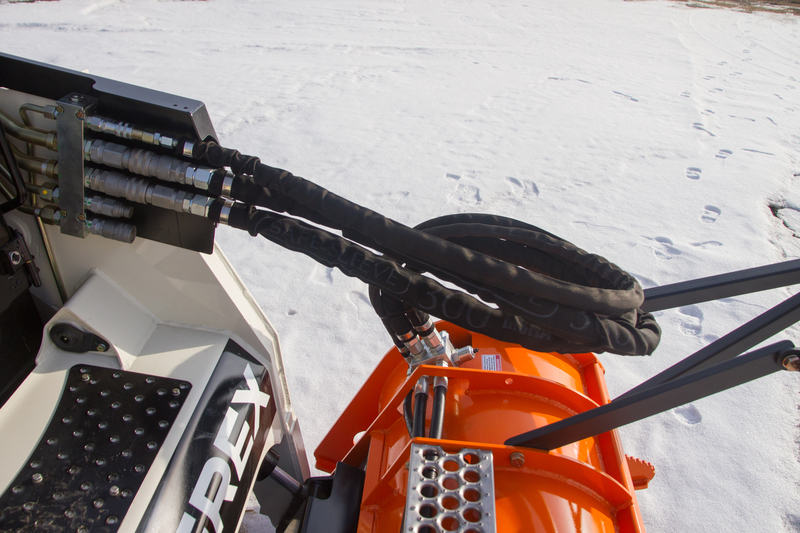 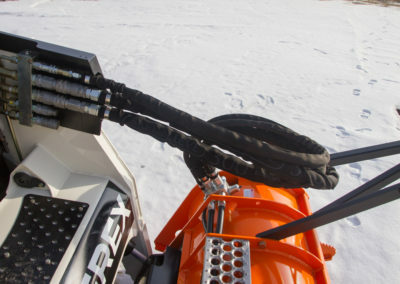 By mounting the hose plumbing on the left, closer to the quick couplers, excessive hose lengths have been reduced between the head and the carrier as well as getting into and out of the cab easier. 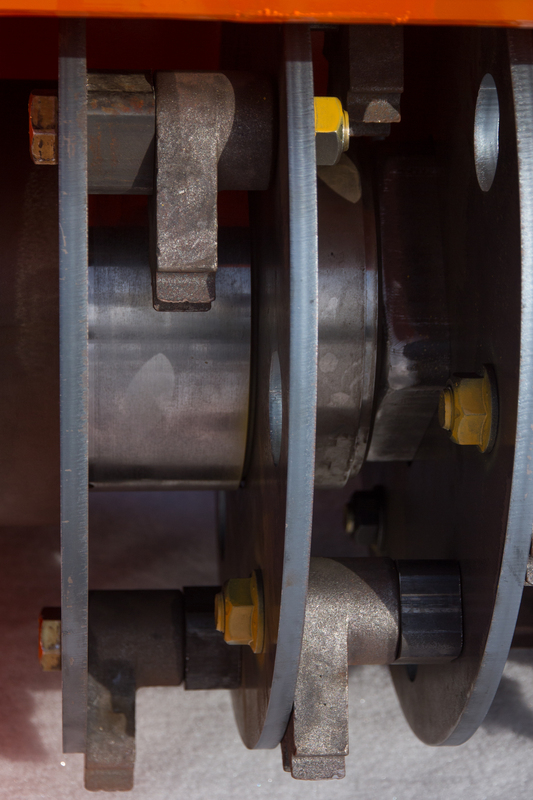 The patented drum is centered to the carrier, there is no offsetting to allow for the drives. 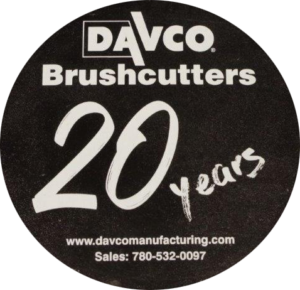 Our curved Brush Guide pulls the lighter brush in toward the center of the head letting the rotating patented drum grab the brush for easier and finer finish without having to make multiple passes. 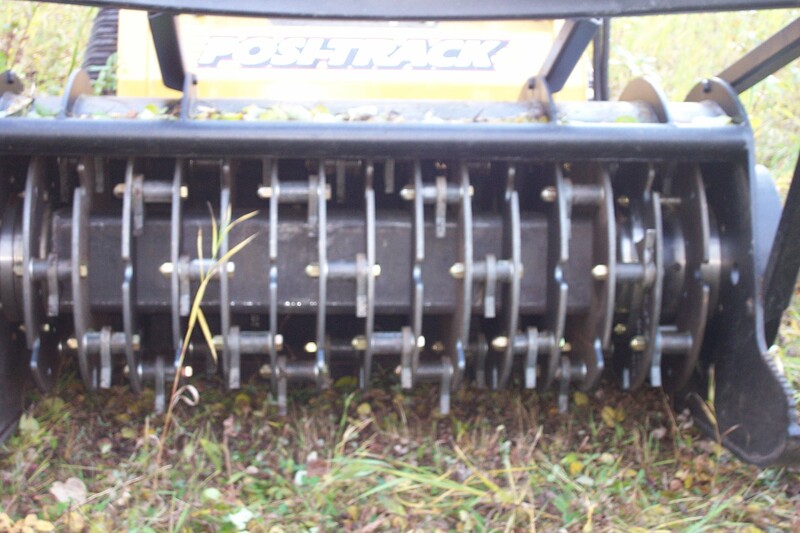 Patented Tooth design has 4 cutting edges per tooth with tooth saver contact point for rocky conditions. 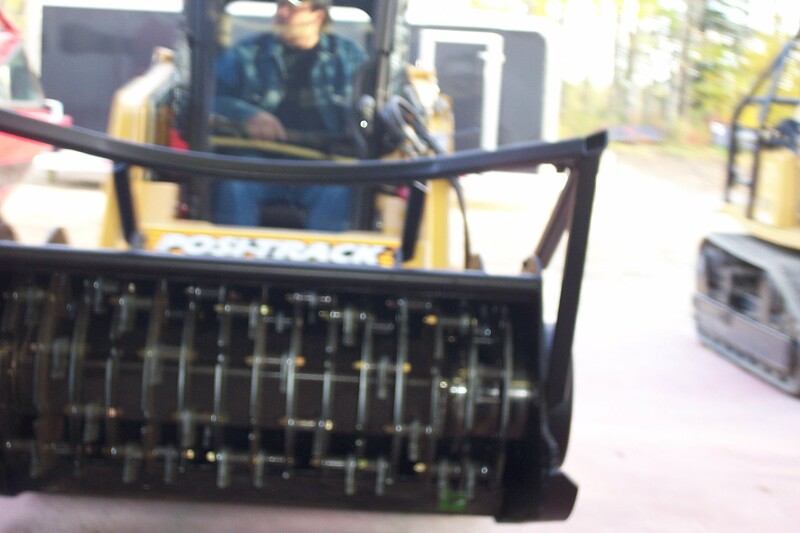 Patented Drum design has the tooth pivot diameter protected in the floating disks, reducing tooth mount impacts resulting in hydraulic spike loads to the carrier pump. 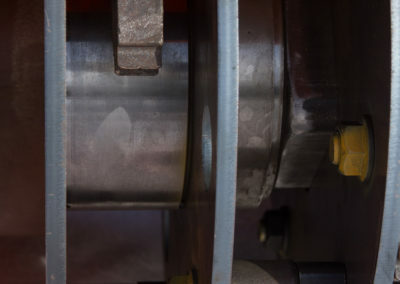 Heavy duty center drive tube with disks sliding “NOT WELDED” onto the tube, therefore eliminating vibration caused by weld stresses into the drum. 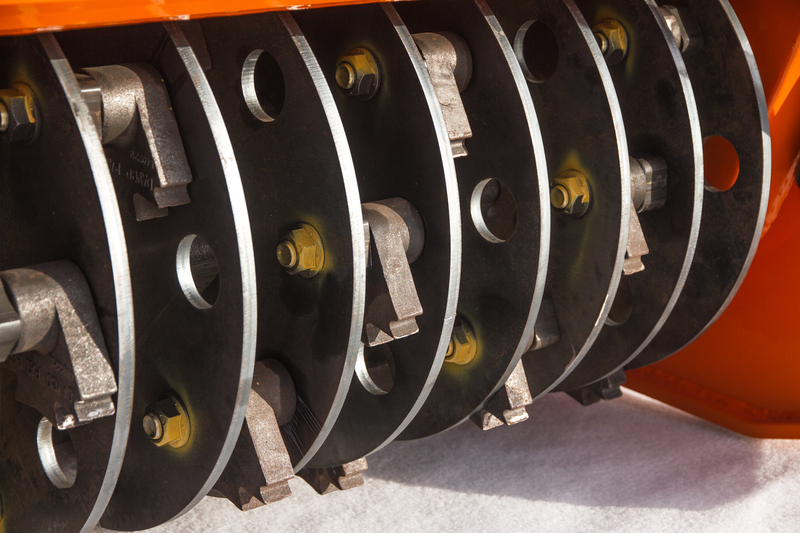 Individual teeth are mounted on a single bolt and hardened sleeve, making tooth changes quick and easy. 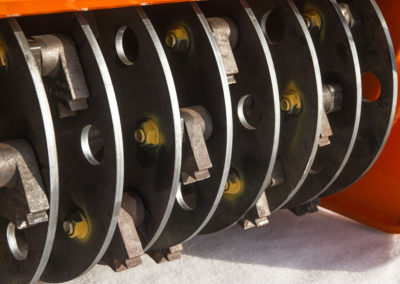 Patent Reversible Teeth have an expected life, depending on terrain and conditions, of 300+ hours when proper drum reversal rotation is practiced.